Want to get more omega-3s? Worried about mercury? Here are some things you should know. 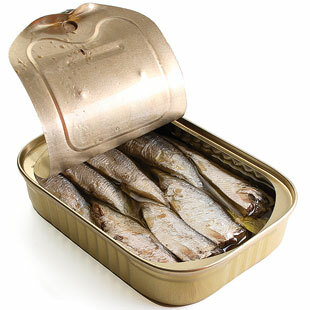 Packed with omega-3s and vitamin D, sardines are one of the healthiest foods we can consume. They are also quick to reproduce and have rebounded since the Pacific fishery crashed in the 1940s, so much so they are one of Seafood Watch’s “Super Green” sustainable choices. When researchers looked into why native Alaskans have such low incidence of heart disease, they discovered their high-fish diet might be the answer. Fish and shellfish are the only significant natural dietary source of docosahexaenoic acid (DHA) and eicosapentaenoic acid (EPA), omega-3 fats that promote heart health and may improve symptoms of inflammatory conditions like arthritis. The American Heart Association recommends eating fish high in omega-3s at least twice a week, and getting at least 250 mg per serving. The fish with the highest levels of omega-3s tend to be “oilier,” cold-water fish, such as sardines (1,950 mg per 3-oz. serving), wild salmon (950 mg per 3-oz. serving) and even mussels (700 mg per 3-oz. serving). Farmed fish are often fed diets high in vegetable oil and usually have much lower levels of omega-3s. All foods we eat contain some toxins—including mercury, PCBs and pesticides. These toxins originate on land (often released by industry or agriculture) and leach into the waterways, where mercury becomes even more toxic as it converts into methylmercury. These contaminants then accumulate up the food chain. The highest levels of toxins are in large fish, such as swordfish or sharks, wild freshwater fish, such as lake trout, and fish like striped bass that spawn in rivers near industrial or agricultural regions. Since high levels of mercury may harm an unborn baby or young child’s developing nervous system, the Food and Drug Administration and the Environmental Protection Agency advise women who may become pregnant, pregnant women, nursing mothers and young children to avoid some types of fish and to choose those that are lower in mercury. To see a list of fish with a health advisory, visit edf.org.